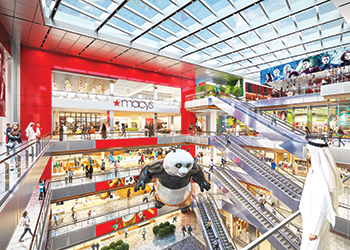 The mall will be home to Macy’s first international store. Leading regional development company Gulf Related has partnered with US-based Elkus Manfredi Architects to start the interior design work on its 3.1-million-sq-ft mixed-use development coming up at the core of Al Maryah Island in Abu Dhabi, UAE. Elkus Manfredi Architects is implementing key design concepts for Al Maryah Central – embracing novel architectural ideas and promising to redefine the UAE’s retail and leisure landscape. Al Maryah Central, which boasts more than 100,000 sq ft of green, open spaces, is scheduled for completion in 2018. Once ready, the mall will be home to Macy’s first international department store, and the first Bloomingdale’s department store in Abu Dhabi and will also feature more than 300 brands, in addition to 65 dining options. Departing from the classic big-box mall designs, Gulf Related and Elkus Manfredi have masterplanned and designed a vibrant community defined by a variety of unique elements, including walkways and retail thoroughfares, and large open spaces to create an engaging, organic destination, says a senior official. The design blends the outdoors and indoors and puts emphasis on the urban fabric of the surrounding city. Both exterior and interior sections face an urban retail setting, with an emphasis on walkability and pedestrian access. Visitors will be able to enjoy outdoor promenades or conveniently access the indoors through a network of air-conditioned walkways connecting Al Maryah Central with The Galleria and other surrounding buildings, says the company. Al Maryah Central embraces the urban planning principle of ‘placemaking’, which seeks to build public spaces that encourage well-being and strengthen the community. “People in the UAE are looking for more than just great shopping – they want a 360-degree experience that provides entertainment, dining and family time,” he states. In addition to the comprehensive mix of contemporary brands, Al Maryah Central will showcase extensive leisure, dining and entertainment options, including a 20-screen cinema, a health club, food market and children’s entertainment, an urban community centre and a public library. It will include daycare facilities, as well as a medical clinic, and will offer direct connectivity to adjacent waterfront promenades. “We are creating more than a mall. We are creating an extraordinary new place in the heart of Abu Dhabi – one that will be the centre of urban life, bringing the people of Abu Dhabi the kind of retail and entertainment destination that they are looking for,” Himmel adds. “In this region, it is more important than ever. Connectivity is the driving concept behind the successful design of this development,” observes Elkus. “It is crucial to not only connect the rest of the island to Al Maryah Central, but also to create streets of shops and pedestrianised walkways inside the development that allow visitors to move easily around the entire destination – from the entry points at street level, up to the rooftop terraces, and across the length of the complex,” he adds.